The University of Delhi grabs eyeballs every year between May to July when its admissions process commences and culminates, and every year along with these takeaways, the flaws in the administration system are brought to the fore. This year’s cycle has been highly prone to technical glitches, chaos over the calculation of marks, and an overall ambivalence over the whole process. Pulling on this thread, a candidate, Paras Nagpal, aspiring to pursue B.Com (Hons.) from the varsity was a victim of this confusion. An ECA applicant, Paras had applied through the Theatre category for admissions. Having scored a 94.25% in his Class 12th Boards, he had temporarily secured admission in Dyal Singh College, after his name came in the merit list released and he ranked 10th out of a total of 100 candidates. The ECA procedure started with a faint idea about the process a few days back when Paras registered with individual colleges according to the guidelines. As per a list which was announced by Ramjas College on July 14th, his name was among the two candidates selected for Theatre ECA, and with surmounting joy, he proceeded to cancel his admission at Dyal Singh College to withdraw his documents. However, much to his dismay, he was denied admission by the authorities on the grounds that an updated ECA list had been released at 11:30 pm. The new list had replaced him with an applicant in the Dance category, and his name was nowhere to be seen on the tabular sheet. Distraught, he wrote a letter to the Vice Chancellor and the college’s page to look into the unfairly handled matter. When speaking to DU Beat, he expressed disdainfully how after checking the list once in the evening, he couldn’t have fathomed that a list released around midnight signed and updated on the website would not include his name. The authorities claimed that there was confusion regarding the best of four calculation of the other candidate whose name made it to the list, and after re-evaluation, she ranked higher. The obvious question that despite four cut-off lists, the fact that the best of four calculations were still erroneously done is deeply problematic. He added that on approaching the authorities with this grave mishandling, they held a meeting for about half hour before intimating that the seats have been fully occupied in the B.Com (Hons.) course. 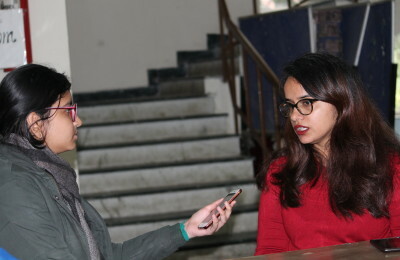 Paras is a resident of Haryana and like many other outstation candidates flocked to the campus when the official admission cycle commenced. After crossing the hurdles of the online application, two rounds of ECA auditions, and an incessant waiting period, all his hopes were pinned on making it through. Now with two days left for the new academic session to commence, he is left with no colleges in his kitty and wishes that the unjust treatment of his case be looked into sincerely. When probed, we reached out to the officials at Ramjas College. Repeated calls to the College’s authorities went unanswered. More than two lakh school graduates every year have a desire suppressed in their hearts. A desire to study at a varsity known for grooming people, for rocketing cut-offs, for rewarding cultural fests, and for three years of an all-encompassing college life. Mismanagement and the chaos blemish the beginning lines of this journey. Great spirit of journalism! ?